Reflux often occurs if the muscles where the esophagus meets the stomach do not close tightly enough. A hiatal hernia can make GERD symptoms worse. It occurs when the stomach bulges through this opening into your chest. First repair the hiatal hernia, if one is present. This involves tightening the opening in your diaphragm with stitches to keep your stomach from bulging upward through the opening in the muscle wall. Some surgeons place a piece of mesh in the repaired area to make it more secure. 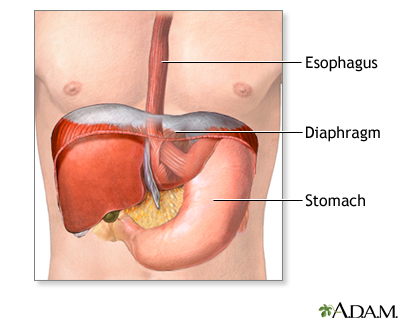 Wrap the upper part of your stomach around the end of your esophagus with stitches. The stitches create pressure at the end of your esophagus, which helps prevent stomach acid and food from flowing up from the stomach into the esophagus. Surgery is done while you are under general anesthesia, so you are asleep and pain-free. Surgery most often takes 2 to 3 hours. Your surgeon may choose from different techniques. Your surgeon will make 1 large surgical cut in your belly. 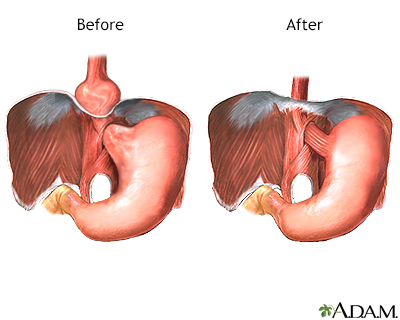 A tube may be inserted into your stomach through the abdomen to keep the stomach wall in place. This tube will be taken out in about a week. Your surgeon will make 3 to 5 small cuts in your belly. A thin tube with a tiny camera on the end is inserted through one of these cuts. Surgical tools are inserted through the other cuts. The laparoscope is connected to a video monitor in the operating room. Your surgeon does the repair while viewing the inside of your belly on the monitor. The surgeon may need to switch to an open procedure in case of problems. This is a new procedure that can be done without making cuts. A special camera on a flexible tool (endoscope) is passed down through your mouth and into your esophagus. Using this tool, the doctor will put small clips in place at the point where the esophagus meets the stomach. These clips help prevent food or stomach acid from backing up. H2 blockers are medicines that work by reducing the amount of stomach acid secreted by glands in the lining of your stomach. Proton pump inhibitors (PPIs) are medicines that work by reducing the amount of stomach acid made by glands in the lining of your stomach. You have more severe problems in your esophagus, such as scarring or narrowing, ulcers, or bleeding. Anti-reflux surgery is also used to treat a problem where part of your stomach is getting stuck in your chest or is twisted. 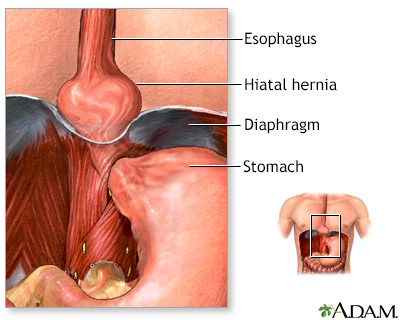 This is called a para-esophageal hernia. Gas bloat. This is when the stomach overfills with air or food and you are unable to relieve the pressure by burping or vomiting. These symptoms slowly get better for most people. Pain and difficulty when you swallow. This is called dysphagia. In most people, this goes away during the first 3 months after surgery. 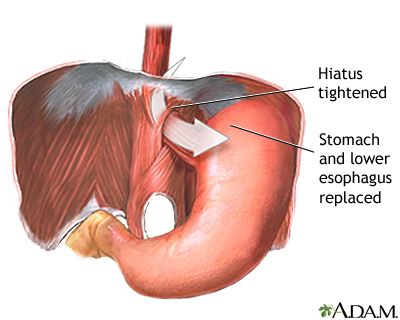 Return of the hiatal hernia or reflux. Blood tests (complete blood count, electrolytes, or liver tests). Esophageal manometry (to measure pressures in the esophagus) or pH monitoring (to see how much stomach acid is coming back into your esophagus). Upper endoscopy. Almost all people who have this anti-reflux surgery have already had this test. If you have not had this test, you will need to do it. You are taking any drugs, or supplements or herbs you bought without a prescription. You may need to stop taking aspirin, ibuprofen (Advil, Motrin), vitamin E, clopidogrel (Plavix), warfarin (Coumadin), and any other drugs or supplements that affect blood clotting several days before surgery. Ask your surgeon what you should do. Follow instructions for showering before surgery. 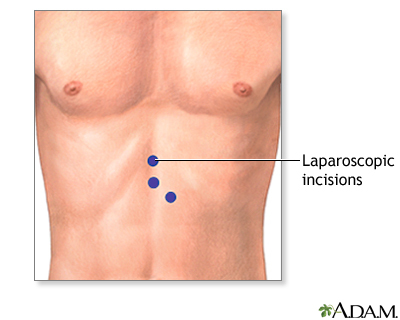 Most people who have laparoscopic surgery can leave the hospital within 1 to 3 days after the procedure. You may need a hospital stay of 2 to 6 days if you have open surgery. Most people can return to normal activities in 4 to 6 weeks. Heartburn and other symptoms should improve after surgery. Some people still need to take drugs for heartburn after surgery. You may need another surgery in the future if you develop new reflux symptoms or swallowing problems. This may happen if the stomach was wrapped around the esophagus too tightly, the wrap loosens, or a new hiatal hernia develops.